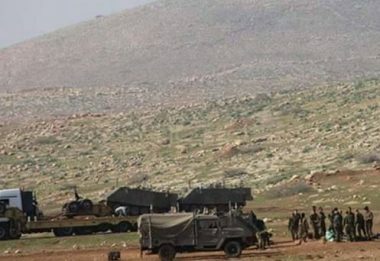 Israeli soldiers invaded, Wednesday, Kirbit Yarza village, east of Tubas in northeastern West Bank, and handed orders to four Bedouin families to leave their dwellings ahead of live-fire military drills. Human Rights activist Aref Daraghma said the soldiers handed official notices to the families of Faisal Masa’eed, Ismael Masa’eed, Jamal Daraghma and Mohammad Daraghma instructing them to leave their residential areas and dwellings ahead of military drills planned for this coming Monday August 6th at 4 P.M. until Tuesday morning. He added that the orders also instructed the families to leave their dwellings again on Thursday, August 9th, ahead of military training starting at 4 P.M until 6 A.M on Friday morning, August 10th. The families were also ordered to leave their dwellings, yet again, on Tuesday, August 14, starting at 4 P.M. until 6 A.M the next day. It is worth mentioning that the army has previously repeatedly destroyed and removed residential tents and small structures in the area, under the pretext of being built without permits. The Israeli army conducts frequent military drills in several parts of the occupied West Bank, especially certain areas of Tubas, the Jordan Valley and near Hebron. Many Palestinians, including children, have been killed and seriously injured after coming in contact with undetonated ordinances dropped by the army during training. In January of this year, the soldiers shot a Palestinian child with a live round in the head, during a “military training” near Tubas, in northeastern West Bank.